Description: Results after hitting garbage truck at grade crossing south of town. 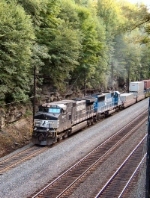 Title: "The Deepest Cut On The Mainline"
Description: Two NS locomotives struggle hard to keep this long intermodal train moving until they reach the top of the hill. Description: Two NS Road Units bring a heavy load of intermodal traffic Eastbound at Cassandra, PA. Description: NS 9407 brings train 192 though Augusta yard, and is getting ready to cross Glass Factory Ave. Description: 18G hits the straightaway after negotiating Oak Tree Curve on a beautiful sunny upper 60 degree day. Description: NS 212 crosses over the Raritan River with a rather short train and no autoracks in its consist. Description: A unit coal drag slowly moves through the quaint metropolis of Rayland. Description: 3 ex Conrail units lead NS general freight 19G westbound at Blandon. Description: And not just the plant that ruined this shot, mind you! Description: 507 with a western visitor and black hoppers is our last train of the day past the signals at MP 128. Description: NS D9-40CW 9574, D9-40CW 9407 and SD80MAC 7203 lead an eastbound coal train.